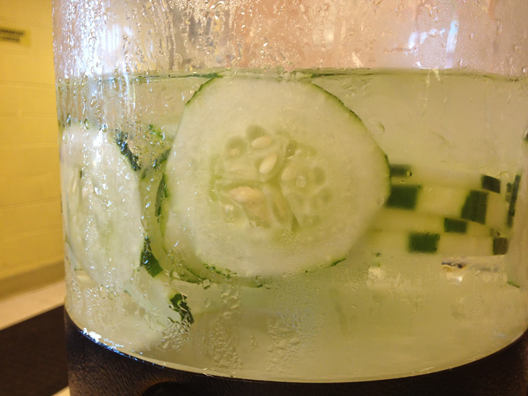 Cucumber infused water, plus it’s incredibly easy to make! You can use regular cucumbers or English cucumbers – just make sure they are organic if you leave the rind on. For visual appeal, you can cut away the cucumber rind in a pattern (pictured) or you can cut away the rind entirely. Unlike lemons and other fruits, the rind of a cucumber does not contribute a bitterness to the flavor of the water, so it’s really up to you if you decide to leave the rind on or off. Recipe for a 2.5-gallon Beverage Dispenser: 1/2 large cucumber, thinly sliced + filtered water (you can use a Brita Pitcher). Chill up to 12 hours for best flavor. There is no need to strain this water before serving. You can garnish each glass with a cucumber round on the rim. Enjoy! I really like this one: D even though it’s a simple one.I tried your “fancier” recipes too but I like the clasic ones more.I mean one fruit/vegetable and maybe mix it with tea.I enjoyed all of your recipes(I tried almost all of them) and thank you for giving me ideas. Even if I prefer the “classic” ones I still like to try new stuff.Also,I like the idea of having a site dedicated to this. P.s. I’ll tell you how I found your site.I was searching for how long should I keep the lemon pieces in the water and bang I found such an interesting site. How long should I let the cucumber pieces remain in room temperature water for the infusion to take place? I would like to keep the pieces in the bottle throughout the day in my office while replenishing the water and drinking it. I trust there is no harm in it. How can you break down a 2.5 gallon recipe for this Cucumber infused water when you only use half a cucumber for 320oz or 40 cups? I live alone and think you cannot keep this water for longer than 3 days. I really enjoy the taste, it reduces my appetite for alcohol and sugary snacks. After exhausting the water I eat the cucumber slices and its so enjoyable. 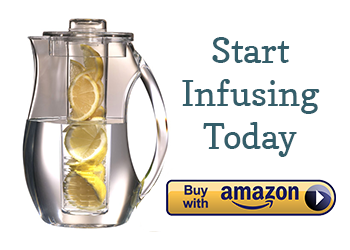 Can I use a plastic pitcher to make cucumber water & lemon water?